Black Sheep 15 Elements, Black Marquinia marble, size: 177cm x 94cm x h 40cm Black sheep realization in Carrara, Italy by TORART. 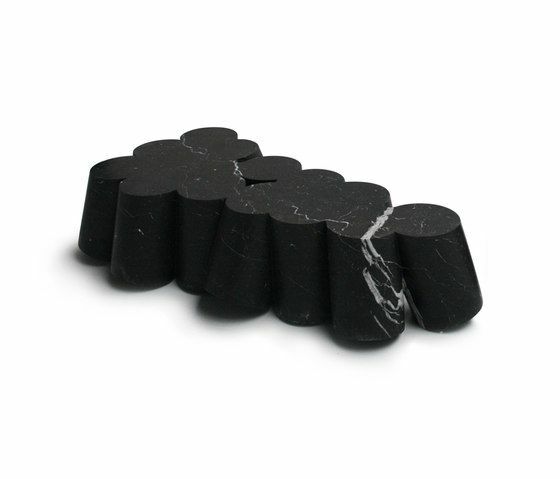 Black sheep is an edition of low coffee tables made of black Marquinia marble. The Black sheep is unique unto itself in its randomness and organic composition. The edition, suggests a visual division of the monolithic stone, and gives birth to movement, impermanence, and origin. This is a blatant step away from the stone's timeless state. The Black sheep is an investigation in an attempt to associate a concept and sensation used to contrast the normal identity of the material used. The Black sheep, as its name suggest, stands remarkably and boldly alone in the past, present, and future. Emmanuel Babled studied Industrial Design at Istituto Europeo di Design in Milan, graduating in 1989 and founding his own studio in 1992.